Number 2 Company of the 1st Battalion Welsh Guards took part in Russia’s 65th Victory Parade in Moscow’s Red Square to celebrate the allied victory and the end of World War II. The 71 Guardsmen were dressed in full ceremonial uniform with bearskins, and were accompanied on the parade by the Central Band of the Royal Air Force. This is the first time there has been a British presence in the massive parade once known as the May Day Parade and renowned for showing the considerable military might of the former Soviet Union. 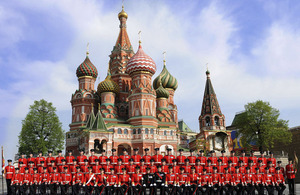 The Welsh Guards marched alongside more than 10,500 Russian troops and others from the United States and France. The event also featured a 1,000-strong military band, 161 tanks and missiles and 127 aircraft. There is a sense of pride to be in this massive parade on Red Square. It seems that everyone is interested in us as well and I’m proud to be a part of that. It’s a brilliant place to be at the moment for the Army and the Welsh Guards. The Welsh Guards, based in Lille Barracks, Aldershot, are spending a total of ten days in Russia staying in one of the capital’s military academies as guests of the Russian Army. Marking Victory in Europe Day in Britain, The Prince of Wales led veterans in a VE Day service at the Cenotaph in London. 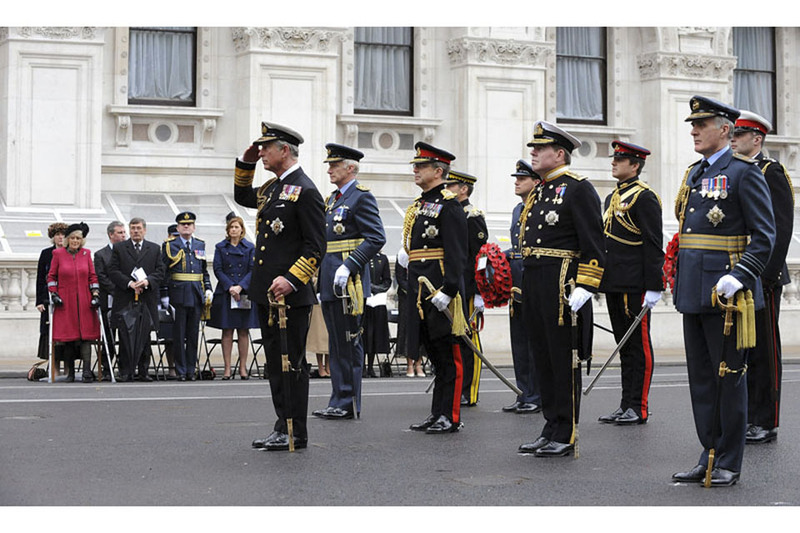 The Prince laid the first wreath at the foot of the Whitehall monument, followed by the three political leaders and the Chiefs of the Armed Forces. Amongst the guests attending were Air Chief Marshal Sir Jock Stirrup, Head of the Armed Forces; Admiral Sir Mark Stanhope, the First Sea Lord; General Sir David Richards, Chief of the General Staff; and Air Chief Marshal Sir Stephen Dalton, Chief of the Air Staff. About 2,000 veterans and active service members attended the events, along with ambassadors, religious and political figures and members of the public. The Last Post was sounded and a one-minute silence was held to honour those who lost their lives.